I originally used the expression in my frequent eGovernment trips to the Arab world. I think the last occasion may have been in Bahrain with a speech entitled: 'The eGovernment Challenge in the Middle East', as an easily grasped illustration of the problems that many countries in the region were facing from the rapid implementation of new technology but I never thought it might find its way back to Heathrow to describe the shambles at Terminal 5.0. In summary, I said that any large, mission critical and complex system need to be robust and fault tolerant and the AK47 Kalashnikov rifle should be the image at the forefront of the designer's mind rather than a BMW car. We need to remember that systems fail and they do so with monotonous and expensive regularity and a modular and tough approach to the challenges of sand and people is frequently a better solution than a sleek and refined vehicle that can break down and needs maintenance when a light bulb blows! 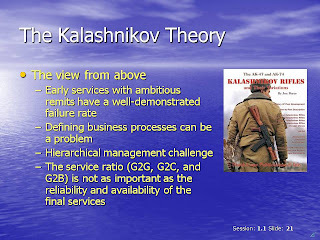 * The Kalashnikov theory assumes that the larger, more mission-critical and ambitious the project, the greater the potential for failure during its introduction. It takes a common sense view that technology is invariably oversold and that in a large scale, public facing project, there is a reluctance to invest in training the workforce to deal with the contingency risk of failure. * Society is littered with the expensive and embarrassing failures of expensive and grandiose IT projects. More visibly in the public sector where the catastrophes are normally greater by an order of magnitude. * Large companies invest in big technology and look for any opportunity to downsize or outsource the workforce in the relentless search for profits. If or when that technology fails or performs to live up to expectations, the business, lacking any other resources is unable to respond effectively and it cannot fall back on its infantry, when it exists behind a telephone line or a webpage. Lacking any true business resilience, customer service invariably collapses as a result and reputation is damaged.